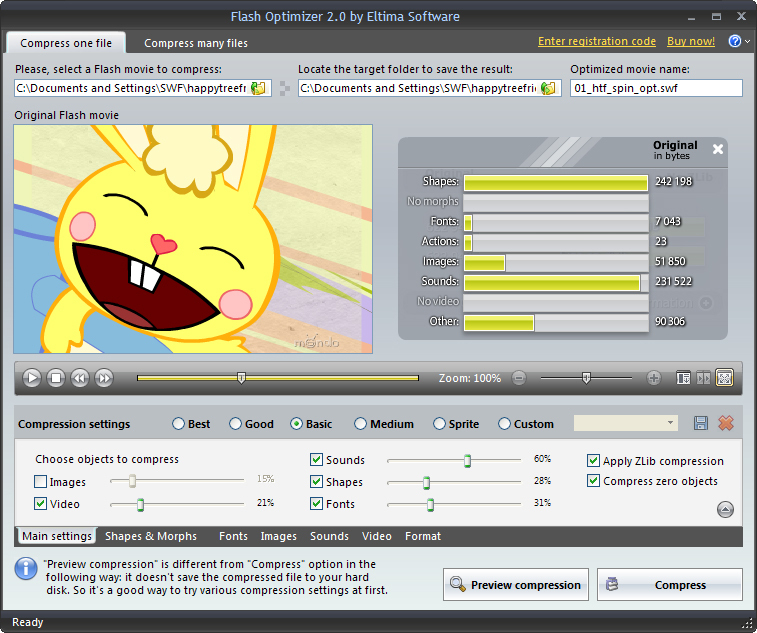 Optimize Flash video using SWF Optimizer by Eltima and reduce size of your Flash movie up to 70%. 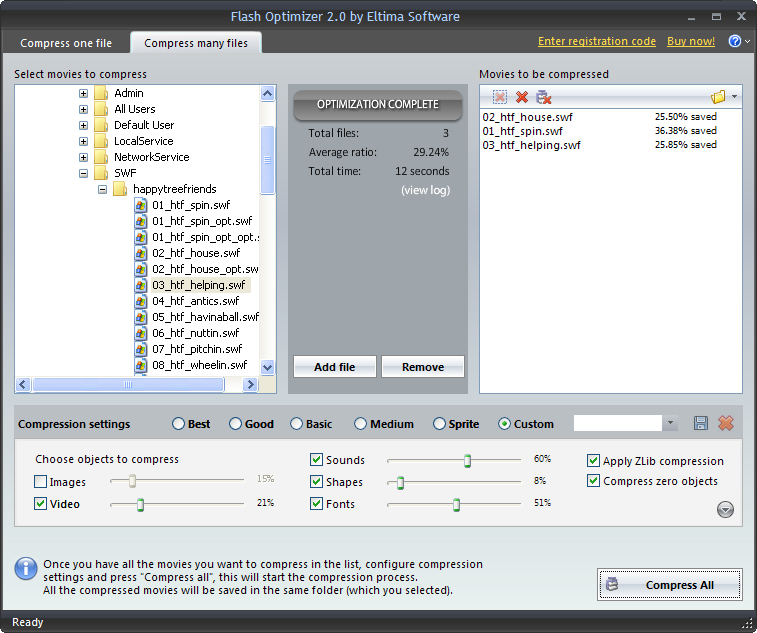 Flash Optimizer makes it possible to optimize SWF files by up to 60-70% without quality loss thanks to fascinating algorithms of vectors, shapes, morphing, Z-buffer, fonts and other revolutionary optimizations. Optimized SWF files will be smaller, while have the same great quality. 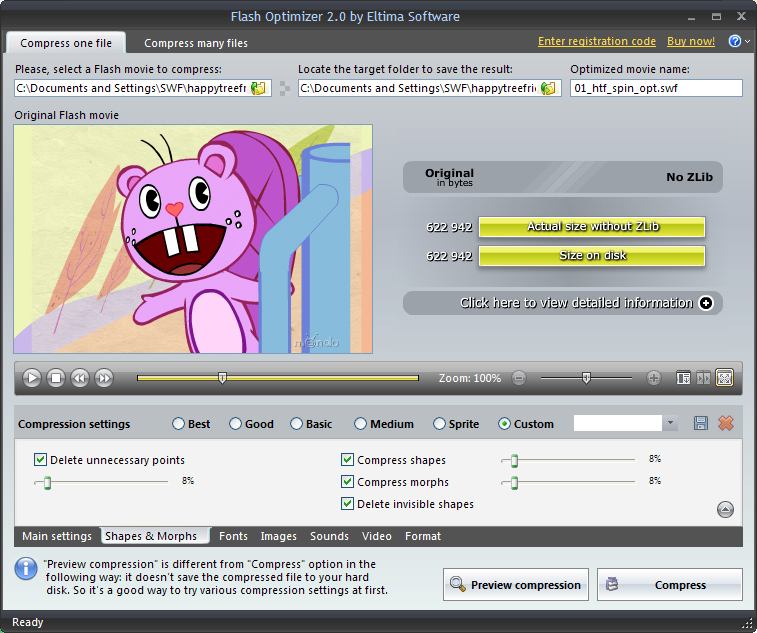 Flash Optimizer is the only compressing tool that fully supports Flash 5, 6, 7, 8, 9 and Flash 10 as well as ActionScript 2 and 3. The interface of Flash Optimizer is designed so that both Flash professionals and newbies will work with our Flash optimization tool with equal comfort. The interface is logically divided into two tabs: "Compress one file" and "Compress many files", making batch optimization even easier. Several predefined compression settings will help you achieve great results immediately! You can check what your SWF file consists of by consulting SWF Info dialog to the right of the file preview. It will show you all the detailed information about the particular Flash movie: size of shapes, images, morphs, sounds, fonts and other elements. "Preview Compression" button will let you see how applied compression settings affect your SWF file. Thus, you can decide which compression settings to choose before compressing the file itself. You will be taken to 100% secure website of Element5, our online reseller, where you'll be able to place your order using multiple payment methods.